2 different performance configurations ranging from 4.9K..22.6K 1K bit RSA/CRT ops. Extreme performance public key signature generation, verification & key negotiation. High performance (Elliptic Curve) Diffie-Hellman key negotiation engines for secure router boxes, secure network interfaces and SSL servers. High performance secure Public Key signature generator/checker engines in Hardware Security Modules. 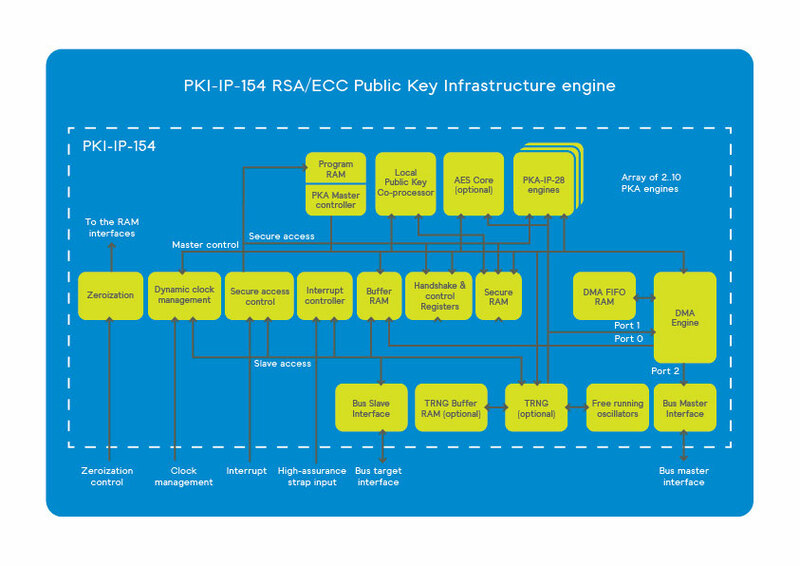 The PKI-IP-154 is available in 2 different performance configurations ranging from 350K to 1000K gates designs, each providing the full set of TRNG and PKA operations with up to 4160-bit modulus size for modular exponentiations and 768-bit modulus for prime field ECC operations. The PKI-IP-154 is a security conscious design and can be provided with or without protection against side channel attacks. For more details please refer to our dedicated PKA-IP-28 and TRNG-IP-76 pages.